You’re exhausted after work. You’re in charge of the neighborhood carpool. You have to cook dinner. Excuses, excuses! Getting into shape only requires 30 minutes. Step back into your 30-minute routine courtesy of Partha Nandi, author of ASK DR. NANDI. Get a pair of good comfortable supportive shoes, whether for running, tennis, or walking. Find comfortable clothing that does not get in your way as you move. Begin with 20 minutes a day and work up to 30. If 20 minutes seems too much, start at 15 and work up to 30. Find a “fitness” buddy or friend to help motivate you. An exercise class is good because it meets regularly and you will have others to provide support. Buy a pedometer (they can be found online for less than five dollars) and count your steps. If you start out at 5,000 steps, work your way to 10,000 and then 15,000. It’s a slow, satisfying process, and every step counts. Every place is rife with movement possibilities. Doing the laundry? How about some arm curls with that full bottle of detergent? If you catch yourself standing next to the kitchen counter, do 10 vertical push-ups. Fitness is moving away from fancy machines and back to good old hand weights. Invest in a light pair of hand weights (2 to 5 pounds) and set them down where you spend the most time. Work your muscles as you watch television. Fitness is getting blessedly low-tech. Whenever possible, walk, don’t ride. Using your legs as transportation is one of the most time-effective ways to fit in great exercise. Be inquisitive. Google. Ask your friends and colleagues what activities they like. Step out of your comfort zone a little. Live! Now that you’ve committed to adding exercise into your schedule, relax and make a quick, healthy and easy dinner. The star of the award-winning TV show, Ask Dr. Nandi, which reaches over eighty-five million US households, empowers readers to become their own health hero.Dr. Partha Nandi delivers passionate, empathetic, and trusted health advice daily to over eighty-five million US households, is seen in ninety countries worldwide, and his Facebook videos have been watched by more than 1.5 million viewers. In a sound bite culture, Ask Dr. Nandi disrupts the status quo by engaging viewers with in depth discussions on the health and wellness topics that matter to their lives. A health hero means being an advocate for yourself and your family, in sickness and in health. It’s about building the confidence to gain knowledge and use that knowledge to make tough decisions. In Ask Dr. Nandi, Dr. Nandi gives readers the necessary tools to become empowered and take ownership of his or her health choices. Whether addressing bullying or prostate cancer, community and purpose or fitness and nutrition, Dr. Nandi tackles the tough questions, stimulates conversations, creates a new awareness of options and resources, and guides readers to confidently make the choices that are best for them. Dr. Partha Nandi is a full-time practicing gastroenterologist, internal medicine physician, and Health Hero activist. His warm, friendly, and knowledgeable demeanor makes him accessible to all. He has his own TV show, Ask Dr. Nandi, a medical lifestyle show whose mission is to improve the health of America and the world with compassion, empathy, and integrity. Airing on seven networks, in eighty million homes in the US and in eighty countries, Ask Dr. Nandi has become a global success. Dr. Nandi’s approach to discussing health care, fitness, nutrition, and lifestyle not only incorporates compassion but also a sense of community, purpose, and most importantly spirituality. 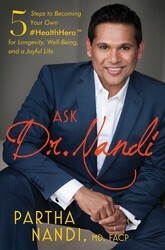 He is the author of the book Ask Dr. Nandi.